We are going to sell two of the cows. It's such a tough decision, but we need to free up some capital to purchase more registered stock. So two of the cows will be leaving the farm in late March. I don't feel too badly about the decision as they are going to the fellow who bought our wee heifer in the fall. The good news is that the heifer will now be reunited with her mum. I suppose that in itself makes me feel better. The other incredibly good news is that now I get to go cow shopping again, and there is nothing more delightful than viewing their fuzzy faces and determining if that one is going to be mine. See what I mean? Delightful. I do think I would like to add more colour to the herd, so I am considering white and dun coloured calves. 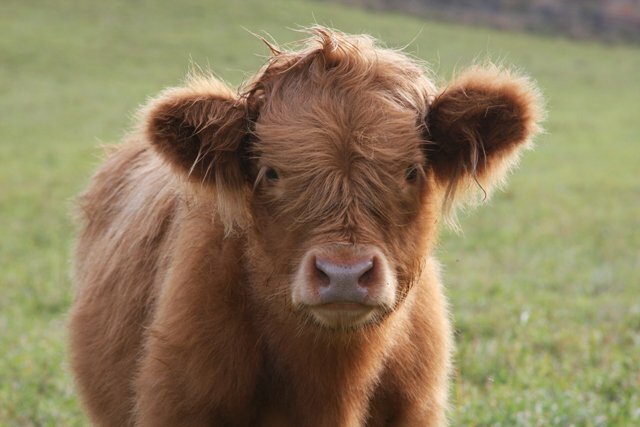 We are also toying with the idea of doing a calf, or cow/calf operation for Angus or Hereford. We certainly have the pasture for it, and it wouldn't be that much work. Well, that's what I keep telling my dear sweet fireman anyway. Besides, he has to have something to do when he's not working right?